Being a rabid anime fan from an early age it was only a matter of time before SpacePizza got sucked into the world of cosplay. She has participated in masquerades and won awards, as well as staffed for San Diego Comic Con’s masquerade. She is now resident masquerade judge here at Anime California and Hanadoki Con! 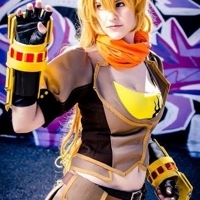 Cosplay in general has brought her many opportunities, including being the official Yang from RWBY for Rooster Teeth at San Diego Comic Con, and being an international cosplay guest in places such as Mexico City. SpacePizza Cosplay is excited to be returning to Anime California and can’t wait to see everyone!